hssc.gov.in. Latest Jobs Alert of HSSC Recruitment 2015 in Health Service. Haryana Staff Selection Commission (HSSC) had released official advertisement on 19th June 2015 for a total of 2881 vacancies for recruitment of Pharmacist, Dental Hygienist Insect Collector, Staff Nurse, Operation Theatre Assistant, Radiographer, Laboratory Attendant etc. HSSC has invited online application form on official website www.hssc.gov.in from eligible candidates. The online application form will be available for eligible candidates from 10th July 2015 on official website. Interested candidates can apply online on or before 31st July 2015. Candidates must note down that only online mode of application form will be ACCEPTED, no offline application form or hard copy of downloaded application form will be accepted by the office. In HSSC Recruitment Advertisement, start date & end date of online application, age limit, eligibility (which will be different for different posts mentioned against the category of candidates), total vacancy, category wise vacancy details, pay scale, grade pay, category numbers are given which will be required at the time of applying online for registration of the candidates for recruitment of 2881 posts in various departments. Besides that advertisement or notification of HSSC recruitment 2015 contains information regarding how to apply online for these 2881 vacancies with online software images given step wise. The age limit for Haryana Health Services vacancies will be 17-42 years and relaxation in age limit will be considered as per Haryana Government Rules. The vacancy details of HSSC for the recruitment of Haryana Health Services through advertisement no. 01/2015 are given below table. 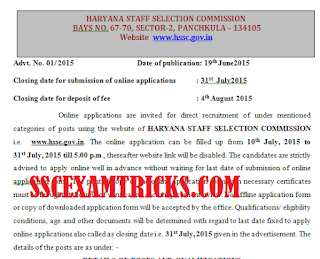 The final selection of eligible candidates for HSSC Recruitment 2015 of 2881 Vacancies of Haryana Health Service will be based on performance in written examination and personal interview (PI). This is Latest news that HSSC Recruitment Recruitment 2015 for 2881 vacancies Notification has been available on official website www.hssc.gov.in. A huge numbers of candidates are going to apply online for HSSC Recruitment 2015 for Haryana Health Service 2881 Vacancies.